Warren Fox grows corn, soybeans and wheat. Fox also uses T-L pivots to irrigate grasses for hay to be fed to his cowherd. This eight-year-old field of WW Spar and Ironmaster is still yielding well despite its age. Fox takes off two cuttings after grazing it until June each year with his cows and spring calves by side. He irrigates two such grass circles from one well, with the pivots making a round every two days. Now he has 30 center pivot systems on the move during the growing season. Fox had experience with irrigation systems from half a dozen manufacturers over the years. 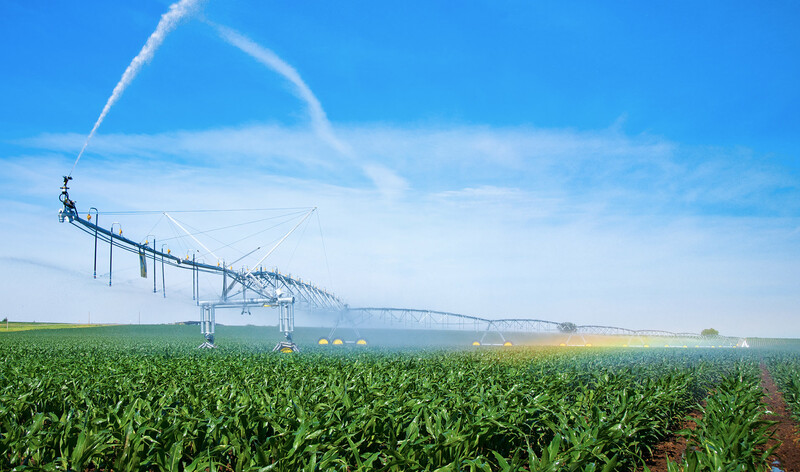 Twelve of his present pivots are T-L Irrigation Co. units, with more to follow, he predicts. He bought his first T-L in 1988. He’d talked with his neighbors using T-L systems who told him they were getting along pretty well with them. Fox likens the continual starting and stopping of electric systems to using an impact wrench on the unit’s parts since it starts at 100% speed and shuts off the same way. Electrics are just not the low maintenance machines that T-L’s are, he believes, based on experience. “If I could take a vacation with all the money I’ve spent on T-L parts and labor over the years it would be pretty short”, Fox smiles. During the thirteen years he’s been using his first T-L system the only repairs it has needed have been one gearbox and a couple of 3/8 inch bolts in the driveline. It’s difficult to calculate the true cost of a repair shutdown, Fox says, but he thinks that crop losses due to three or four shutdowns a season while the unit sits a half-day or more, can quickly add up to affect his bottom line. On the other hand, Tom Wright IV of Lakin, Kansas, started with flood irrigation. His methods evolved from ditch, to pipe, to surge valves over the years, yet he still wasn’t satisfied. “I was looking for more efficiency and labor savings,” he recalls, explaining why nine quarter-mile and two half-mile systems have replaced flood irrigation on his land. Efficiency is also important to Wright since his wells range in capacity from barely 300 gallons a minute to 450 gallons a minute. 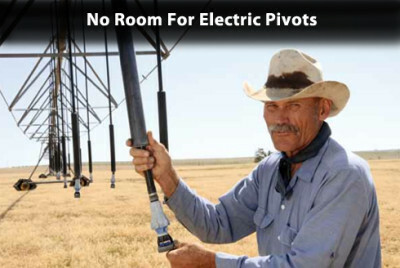 He’s also noticed none of the “spoking” effect typical of the continual starting and stopping of a neighbor’s electric pivots. This can leave portions of a crop wilted immediately after the pivot has moved on. The start stop factor no doubt contributes to increased wear, too, he reasons. As for his T-L dealer service, Wright says it’s gone from good to even better. And, he likes the full service offered that enables him to deal with just one firm for everything from irrigation well to pipe to sprinkler. There’s one almost sure thing in Laverne, Oklahoma: The T-L center pivot just outside of town at the old refi nery clean-up project will be running–day and night, spring, summer, and fall, and most of the winter, too. For the last five and a half years it’s been operating at least 85 percent of the time, according to Boog Evans, the contractor in charge of operating the unit. The system is just a shade more than halfway through a ten year cleanup program. Evans figures in that limited period of time the heavily used T-L has been handling its sprinkling chores for more than 41,000 hours. At an average 175 gallons a minute, 430,301,000 gallons of water have flowed through its nozzles. When the refinery closed down it was found that petroleum products were working their way closer and closer to the town’s wells. At first it was thought that water “cleaned” by bubbling air through it could be sent to the river via an old pipeline. The pipeline had become porous, however, and Plan B was to keep the water on site. Pumps move water from wells dug around the perimeter of the old refinery to one of several “cleaning” buildings. From there the water goes to a holding basin from which the water is pumped to the adjacent T-L center pivot. The average application rate on native grass seeded on former cropland is between 150 to 200 gallons a minute. A local farmer handles the hay harvest chores. 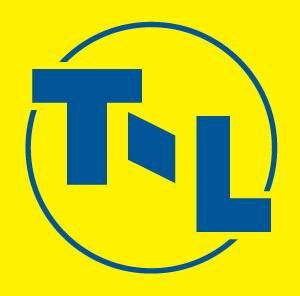 Like the famous battery bunny, the T-L system has just kept going and going and going, according to Evans. There have been only two exceptions over the years. One is when Evans sees a forecast for a few days with below freezing temperatures. When that happens he pulls down the holding basin by increasing flow through the system before temporarily shutting it down. The other exception was a tornado that tried its best to roll up the center pivot into a steel ball! Evans says, “The T-L dealer has always been only a phone call away.” In two weeks the dealer had the unit running again, and it gamely continued to apply water to the hayland, although with two fewer towers. While it took a twister to do it, the only real trouble Evans has experienced with the T-L system came immediately after the storm. The jerking around and tumbling the pivot endured caused some hydraulic fluid leakage. However, after chasing down and stopping the leaks, he reports virtually no hydraulic fluid has been used for the past year and a half. As for other repairs, the records show that only $1,501.23 has been spent. That figures out to just $273 a year or 3-1/2 cents an hour for a center pivot that’s come as close to continuous operation as just about any such unit in the country. It’s actually been so reliable that Evans reports that he now schedules a single visit a week to check the gearboxes and tire pressures, even with mostly 24/7 operation.